Serving Boards have certainly become a very popular way for cafe's and restaurants to serve. The great versatility they offer is key. - Partner with disposables or other unique sauce, chip and side dishes. - Exciting changes in cultery also complement the serving boards well. Whether you choose to serve your stand out dishes, or just your lunch and breakfast options that suit. You can use them as tasting platters, tapas or cheese boards, or even a great dessert board options particularly in the Coral or Natural handled Mangowood boards or even the NEW Marble Effect Melamine Chef Inox boards. They offer a look and feel of opulance without the additional weight and rise of damage or replacement cost. The melamine options is also a much easier care practice and offers longevity of your products. So which to choose ? It really is up to you, the use you have intended, your establishement and what suits best decor wise, you location sometimes - for example a beach side cafe vs an inner city hotel restaurant. The good thing is we have so many varieties we are sure to be able to assist. Mangowood Boards are a natural product sourced from sustainable methods of havesting. You know you have a quality product when each individual piece has been hand made, and you can also then expect a unique look with different grains, variations in colour and shaping etc. There all feature soft tones that make a really stunning backdrop for all foods. Food Grade and packaged for Retail Sale this range has a lot to offer. Chef Inox Wood Oak Effect and Marble Effect Boards are sleek, creative and a very clever concept. Offering the look of Wood Oak or White Marble with the durability of Melamine - the ideal solution for so many events, in the food and beverage industry not to mention general daily service. They are ideal for table service however also a very nice hot of cold display cabinet option. Very easy to maintain as they are dishwasher safe, stain and odour resistant and chip resistant. Also food grade and suitable for commercial high use kitchen and event services use. Art de Cuisine Slate Platters are stylish, functional, and alluring. They are a laminated natural slate. Created to offer an exciting display for buffet service. They can be added to rises to really create a dramatic and stunning modern look. Table top allure is a definate with passer by's being unable to deny themselves half a dozen oysters plated up on a long rectangular slate plate with white rock salt against the natrual dark coarseness of the slate. Desserts are devine with raspberry couli splatters on the alluring black backdrop and lush peach segmenets partnered with a white as white baked cheesecake - your options are endless with Slate - the food looks amazing with the dark, natural, smooth yet coarse and realness of the slate. Ryner is a brand we all know - it is trusted for quality ! The Ryner Melamine boards - Wood Deco are just that a quality product that is sure to stand up against the high turn over and use in a busy kitchen. Also a great option for buffet use counter display and more your options are endless. 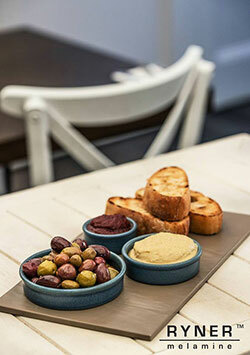 Cheforward is a NEW and exciting range of Lapis Melamine Serving Boards. The use of the centuries old wood to create stunning table top pieces for your restaurants, cafe's, events and home use. The petrified wood elevates the visual effect of the ancient trees with vibrant colours that are visually appealing both on their own and then when partnered with food. On first glance these unique pieces look like mesmerising fossilized wood, however on closer examination and I mean close.... They are in fact durable, washable, stain and oil resistant MELAMINE.. Yes Melamine, I had people not believing me. There are five distinctive patters/colours and two unique handeled shapes to choose from. The colours will vary in the Cheforward pieces as the minerals used vary. This exciting range if Lapis Melamine boards from Cheforward are sure to be popular and we are thrilled to have them as part of our Serving Board options in 2016. So there is a few options for you to think about if you are looking to start using serving boards in your establishment. There really isn't just one option to suit all, or one option that is the better option, there are so many elements in today's Hospitality Industry to take into consideration. So many colourings already in use and food styles or even Chef's styles to take think about. We love to offer options and here are ours !